We will be taking a field trip to Washington DC, tentatively scheduled for Friday, Feb 24. The accompanying assignment will be due by 1 hour before the start of class on the Monday after the trip (everyone – whether you go on the trip or you do the alternative assignment). 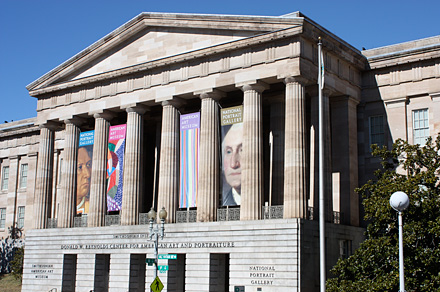 We will visit the Hirshhorn Museum and the Smithsonian National Portrait Gallery. It will be a full day trip – we will leave at 8am and get back at approximately 10pm. WVWC will cover the cost of the van rental, gas, and parking. If you are unable to attend the museums with the class on that date, you will be required to visit the exhibitions on your own anytime before the assignment is due (see calendar) or do the research paper (details at the bottom of this page). IMPORTANT: We will meet in the parking lot behind the art building at 8am. Be there early (we will leave promptly at 8am – I have left students behind before). Make sure to write down/print out the assignment so you don’t forget it when you are at the museums. You can bring snacks with you to save money. We’ll find places to eat for lunch & dinner. – Total museum admission $0 – FREE! Make sure you eat something for breakfast – this will be a long day. We will spend approximately 1.5-2 hours at each museum/gallery. Often at museums and galleries, you will be asked to check your backpacks and/or coats. When we arrive, we will review the museum map as a group (if they have one). There will be a LOT of walking. Be ready by wearing comfortable shoes and layers of clothing that you can easily take-off/put-on. I always recommend keeping an eye out for any tours that might be passing through the museum – you can often tag along and hear a lot of interesting information that you wouldn’t otherwise get. Write the assignment into your sketchbook ahead of time, so you remember it when you’re in the museums. While we’re on our field trip, your assignment is to write a review of an artist’s work at any of the venues we visit. Imagine this work will be published in a newspaper – you must include all the items listed in the grading section below. You have to have a good introduction and conclusion that makes readers want to continue reading. If you’ve never read a review of an artwork or an art exhibit, check out old reviews on Glassblock, or Pittsburgh Articulate, or the New York Times. Analyze your chosen work in terms of subject, form, content, and context. Interview at least 3 different people who also saw the work, and include their impressions in your written review noting how you agree or disagree with them. Reference any artist statements or curatorial notes available (either in the exhibition space or online), and discuss these statements’ usefulness or clarity, or lack thereof. If you cannot find any artist statement or curatorial statement, find a different artwork to write about. Research past work by the artist and draw connections to the work you just saw. If the artist is available, interview them about the artwork. NOTE: If you are going to the museums not as a part of the group, you must sign the PDF waiver (print it and turn it in before going on the trip). You must also show proof of your admission, and have your photo taken while you’re there (next to their sign, or next to a work of art, or next to one of their gallery attendants, etc). You must still complete the assignment as described above and by the deadline stated on the schedule. You must find 6 sources in our library (books or database articles), 1 can be an online source. You must include a works cited (MLA format for citations). The paper must include no more than 1 page of biographical material. The remainder of the paper must explore the ideas put forth by the person you are researching, and you must relate those ideas to works of art. All reports will be submitted to SafeAssign to check for plagiarism (checks against everything on the internet, and all the papers ever submitted to SafeAssign). To utilize this alternative assignment, you must tell me at least 2 weeks before the trip that you are not traveling with us in the van.